Taking inspiration from the mountainous landscapes of her home country Austria, Regina Heinz creates hand built sculptural ceramics, ceramic reliefs and wall pieces. Basic geometric patterns and structures are distilled from nature and form the vocabulary of her designs. Created from soft slabs of clay, Regina’s work is abstract but evocative, displaying an organic and sensual quality, reminiscent of human skin and the undulating "landscape" of a body. Each piece is exclusive, combining form, surface texture and colour in a unique way. 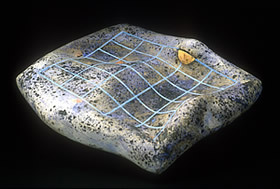 Regina Heinz works for national and international exhibitions as well as to commission. Visiting these pages will give you an insight in her visual language and original technique.